If there’s one thing I love [and hate at the same time] about one year ending and a new one beginning, it’s all the possibilities of setting goals, finding challenges and compiling lists of things we want to achieve during the next year. I figured I can’t possibly be on my own in that one, since I know we all love reading challenges. Not to mention setting ourselves reading goals to challenge ourselves throughout the year! Sometimes it’s simply hard making up our minds about them but okay. Which is why I thought you’d be interested to see the challenges I’ll be joining myself. I’ve been working on this post for quite some time since not all challenges are announced at the same time – not to mention some will only pop up in January! – and I had to figure out which ones to join and which ones to leave be. If you want to talk about the whole subject of yearly reading challenges, I encourage you to check out this post where I talk about the struggle of setting yearly reading goals! The first one I wanted to check out, before any other reading challenges, was the Popsugar Reading Challenge. I first found out and joined the 2017-edition and absolutely loved it. Although I didn’t participate this year – honestly, I didn’t like quite a lot of the prompts so I ended up creating my own bookish bingo – I’m so ready to jump back on the Popsugar-train in 2019! There are still some harder prompts, but I feel up to them? Either that or it’s a genre-related prompt and I don’t tend to shy away from those since I love trying out new genres once in a while! [Has anyone ever heard of cli-fi? Or LitRPG?] I already made a list with all the possible books I could use for prompts. It’s not finished, at all, but it definitely showed me how it’s totally possible to rock the challenge! Important side note though: I’m only going to challenge myself to tick off half the prompts for this one. I don’t want to pressure myself too much! As for the next challenge.. That’s one I had going on in 2018 as well. I’m officially naming it the “Boyfriend TBR Challenge” with the simple explanation of.. my boyfriend set the challenge! Last year, he challenged me to read 75 of my owned books – the ones I owned before January 1st, 2018. I asked him to do the same for 2019, which means I’ll be trying to read 50 of my pre-2019 books again! He didn’t even want to lower it at first, until I pointed out the tiny fact of our lives changing a lot next year. Good thing he changed his mind or this would’ve been doomed before it even started?! Then there’s the regular “Goodreads challenge” I can’t pass up on. As last year, I’m going to keep track of both the books read and the pages read. I really believe the latter gives a better view of how much we actually read. There’s such a difference between reading ten 200-page novels and ten 350-page ones! Last but not least.. In 2018 I really wanted to reread the Harry Potter-books. Of course there are some other series I’d love to reread so I’m making this a yearly one as well: “Series Challenge“! In 2019 I’ll be trying to reread all the Shadowhunter-books by Cassandra Clare! And because I failed tremendously at my 2018-goal of reading the Game of Thrones-books.. I’m adding those to the challenge as well. Let’s hope I actually read at least one of them this year? So far that still hadn’t happened though. I’m thinking I can conclude my 2019-goals are.. impossible or seem to be? If you do the math, it simply won’t be doable to combine reading pre-2019 books with rereading the Shadowhunter-series and then read the GoT-books on top of that but.. Honestly, since my life will be all over the place, why not my reading goals? That and I simply have no clue whatsoever what’ll be doable and what won’t be so.. I don’t know. This fits my state of mind perfectly? What do you think about my goals? What would you do differently if you were me? What are some of the reading goals you’re setting yourself for next year? Any other goals – outside of reading – you want to work on? Let’s talk goals in the comments! I haven’t read through any of your comments, so I apologize if anyone has recommended him to you already, but if you’re looking for an intro into the LitRPG genre, I definitely recommend Phil Tucker (I haven’t read him yet, but I heard he was really good). I’m definitely doing the Around the Year in 52 Books challenge on Goodreads, because I really enjoyed it this year. 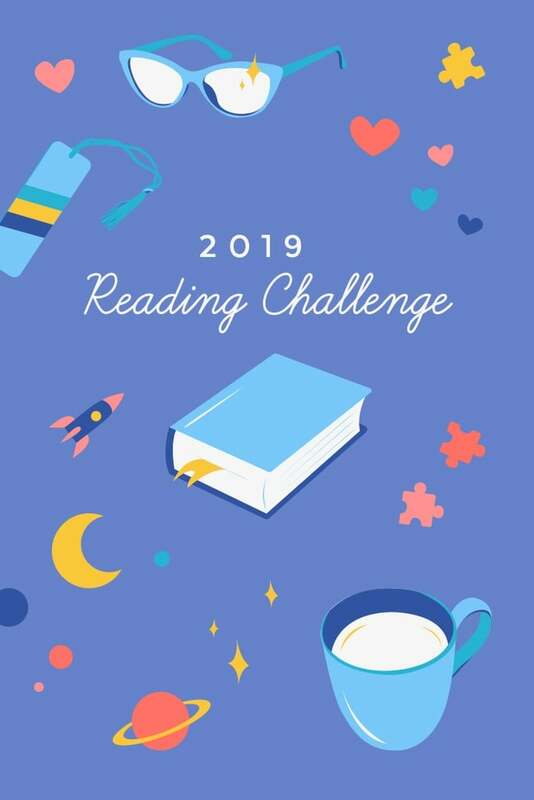 I’ll also be trying the Popsugar Reading Challenge for the first time, although since it’s my secondary challenge, I’m not really setting a goal for myself, I’m just curious how many I’ll be able to do. I actually had to look up cli-fi and LitRPG as well, but I’ve been kinda into solarpunk and I think that has a lot of overlap with cli-fi? I’m also interested in reading a choose-your-own-adventure book that is not a children’s book. A Harry Potter re-read is actually on my list too!! I originally read them in Hungarian when I was a kid, and then a couple of years ago I bought the entire series in English because it’s a beautiful edition with awesome covers, but I never actually read them. So this would be my first time reading them in English. Hahaha, that’s so true. I always try switching between the harder prompts and the easy ones, but it isn’t that easy most of the time. Awesome! I’ve heard about Around the Year a couple of times, but I’m not really interested in doing it myself. I’d rather do the Popsugar one, hah. Seeing how many you’re able to tick off is definitely a fun way as well. You might surprise yourself! Hm, I’d say that definitely has an overlap! I’ll have to check what book to use for LitRPG. I think I already had a small list of options but none of them really spoke to me so we’ll see. Ooh, reading them in English for the first time really is so much fun! I enjoyed it even more because I actually learned the English names for everything and everyone – FINALLY, haha. Yeah! And sometimes it’s difficult to judge anyway – my last prompt that I struggled months with was actually a book I’ve been looking forward to reading, but I still kept putting it off. But I officially finished!! I personally like the prompts in ATY better, Popsugar has more that are completely out of my comfort zone or would require me to spend money. But to each their own 😀 and thankfully there’s some overlap where either two prompts are almost the same, or I can use the same book for two different prompts in the two challenges. I looked up LitRPG as well but the only one I’ve heard of on the lists was Ready Player One, which I heard bad things about. That’s the only one my library has though, so maybe I’ll give it a try to judge for myself without having to buy it? I’m curious what others will read for that prompt because I don’t think it’s an easy one. I read Ready Player One and did enjoy it? Although I was waaay less critical about books back then so that might have something to do with it as well, haha. Oh, true! Sprout is Spruit in Dutch so just seeing them like that is already pretty obvious but there are definitely names that made no sense at all. McGonagall being “Anderling” for example. I literally see or know of no connection there, haha. I only did the entire thing in 2017, then made my own bingo this year and now.. I just want to attempt ticking off half the official prompts? There are some on there that aren’t QUITE to my liking anyway so it gives me more freedom, haha. My goal is to read more! I’ve been in a reading slump for quite some time, and I really want to get back to where I read at least three books a month. Awh, that’s a pity! I hope you get out of that slump soon! I always start off the year with so many good intentions with reading challenges and then they all start to go off course! The Pop sugar challenge is always one I love to check out. Same! It always makes me pick up books I usually wouldn’t have read. I love challenging myself but my life is so hectic I have to be careful about what commit to. Hahah. I love the Popsugar one because I always discover books I never would’ve picked up otherwise. Not to mention finding books that fit certain prompts I didn’t expect them to! These look like a lot of fun! I participate in monthly challenges on Goodreads, but might wind up joining the popsugar challenge, you’re the second person I heard mention it in the last day or so. The Popsugar one is amazing if you want to discover books outside of your usual genres! I have finalized my goals for next year yet but I will for sure be participating in the Goodreads reading challenge and I am shooting for 100 books again next year. I’ve also been considering participating in beat the back list and the Alphabet Soup challenge (authors & titles). Nice! I joined Beat the Backlist this year but only submitted my books for the first two or three months. I simply kept track myself after that, which.. beat the purpose of joining but oh well. Ok that was supposed to say I haven’t finalized my goals oops. I tried the Alphabet Soup titles one the past two years and I have failed both time I think this year I might just try the authors one. Yeah I’m definitely going to be trying it. I’ve already got my post typed up and ready to go. I love the goal of counting the pages you’ve read and not only the amount of books! Really considering doing that myself. So far I’ve signed up for the Beat the Backlist challenge and will set a Goodreads goal. You should! It gives a way better view of how much you actually read throughout a year! I’ve been reading some novellas and short stories lately and those up my number of books read, but barely add to the pages read. Then there are those tomes you take AGES to read that only count as “one” book, but should count as three page-wise so.. Yeah, haha. I believe I’m going to try to keep track this year of the pages! It sounds like a interesting task, haha. I did lose track of what books I submitted for Beat the Backlist last year. I’m hoping to do better. I do like the mini challenge this year though with the Hogwarts houses. Simply keep a spreadsheet with all the books you finished and make sure they’re in the order you read them. That way it’s always easy to add to the list – using Goodreads and all. 😛 Worked for me so might work for you as well! I’ll have to check out Book Roast’s magical readathons. It sounds interesting. Oh, i love your book choices for the popsugar list! ❤ Really cool! These are great reading goals! One of my many 2019 goals is to finally finish the Harry Potter series. I’ve only read books 1 and 2. I hope you have a great reading year. Ooh, I hope you end up finishing them! Should certainly be doable since so many people reread them pretty much every year, haha. Love your goals. I am in the process of thinking of my own goals for the new year. I have been setting up a calendar. I think I want to try to coordinate my reading to each month. For example, March is Women’s History Month so try to focus my reading around Female authors or books about famous women. October, I want to read Stephen King novels. You get the point. I do want to set aside some time for Harry Potter as well but I haven’t decided when yet. I have never finish the series and I think it is time. That was what I was planning for February. I definitely have a books I have been wanting to read that pertain to this topic. I agree about HP. I think I am going to use the summer for rereads of lighter reading, books that I love but have never reviewed. Harry Potter would definitely fit in then. The Popsugar one is a reading and puzzle challenge in one, in my opinion. I always end up switching books around to make sure I tick off as many prompts as I can haha! Love your goals! I’m doing Goodreads, Beat the Backlist and I might even try an A to Z challenge this year…..
Getting the links off Amazon is like pure torture sometimes!!! !